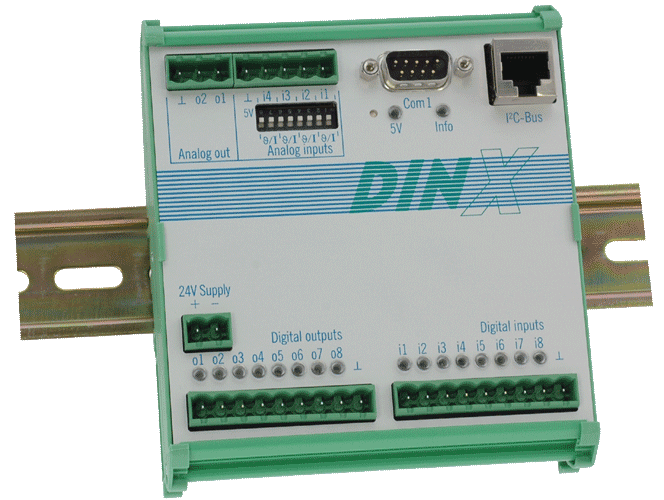 DinX is an inexpensive and extensible microcontroller for switchboard mounting on DIN-rails. The powerful 16bit processor and the large memory allow applications that demand data storage (measurement data, service data), local pre-processing or host communication. 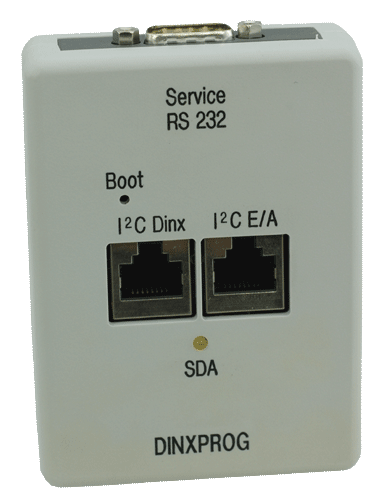 Compact controller like DinXA, but addionally isolated RS232 interface. Screw terminals like DinXA. 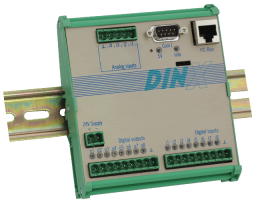 DinX is available in three configurations: The minimum configuration (without D/A, A/D only 5 V, no clock, RAM not battery backed-up), a standard configuration and one with either BITBUS-network extension or a second RS232-interface (isolated). The networked version can be used as autonomous peripheral unit, for example to receive data over the RS232-interface from a measurement device or machine and then process the data in regard to its own digital and analog inputs. Locally the 24V and the analog outputs are used for controlling, while data is being condensed, stored and kept on call for the central computer. The mCAT realtime operating system supports complex tasks by message as well as event initiated task processing. The digital and analog i/o are accessed by hardware independent i/o objects. This way all digital inputs can be used as event counters up to about 100Hz (the 3 hardware counters up to about 1kHz). Beside their normal function, the digital outputs can be used as monoflops with delayed switching or as pulse generator with adjustable on-time. In the same way the input signal can be reconditioned, depending on the connected device, to temperature (i.e. -25...102°C for KTY), to current (0...20mA) or to voltage 0...5V. Since the converter has 10 bits the effective range can be resolved into 1024 steps. On the module a special setup for Si-temperature-sensors KTY can be selected with DIP-switches at each input, or alternatively a 178Ω shunt 0/4..20mA can be used ("A" version only). In the software, linearization can be selected with CFG_SET_CHANNEL_RANGE. On the minimum configuration only the standard 5V range is usable, but for temperature measurement a LM34-sensor can be used, which is scaled by mCAT, if Express-i/o is configured this way, to 15..+250°C, the output unit is 0.1 degrees. The sensor on the module1 allows to estimate the temperature of the switchboard. Another fixed analog input is the voltage measurement of the supply current. Even though the module is quite tolerant concerning voltage, functionality of the outputs is not guaranteed below 15V, therefore the option to check the value comes in quite handy. With the external sensor conditioning unit Pt100V4 RTD temperature sensors can be linearized (-50..205°C). The analog outputs are addressed with 0..10000 corresponding to 0...10V. DinX has a TLCS900-H processor with 1MB flash and has 512k of RAM available. The A version has a battery backed-up RAM, so that data can even survive a power failure. The mCAT module BgMem provides software support for ring buffers, FIFOs or LIFOs including CRC-generation and verifcation. The SER0 interface of the processor is implemented as RS232-interface with 9pin sub-D-connector. The mCAT interrupt driver SerDrv can be set up to wait for a programmable start character and optionally one or two end characters, alternatively for a fixed message length. Only after assembling the whole message the task waiting for it gets activated. The interface can be used for local communication with peripherals such as barcode readers, label printers or weigh scales. 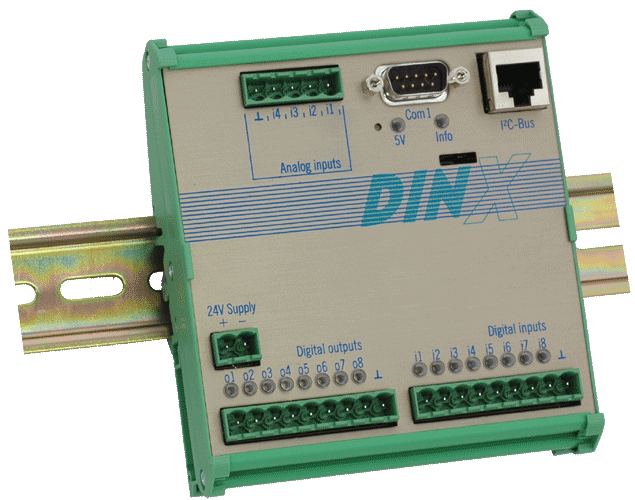 For a host-connection over long distances or to other departments, we recommend the DinX(A)232 module with an additional isolated RS232-interface (SER1 of the processor). 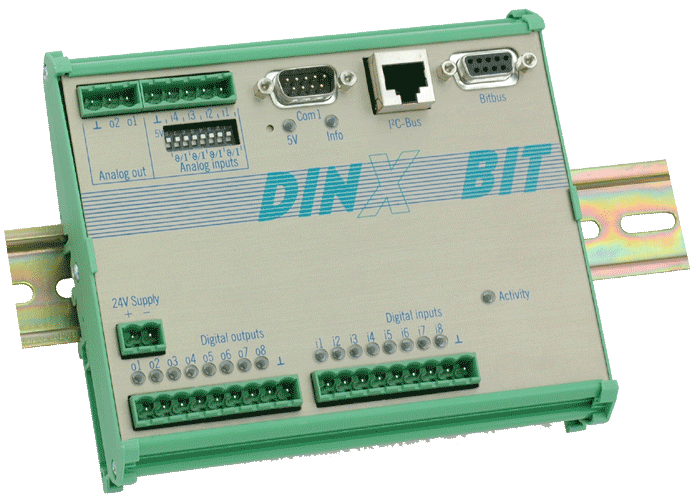 DinX is programmed through a "hidden" serial interface in the I²2C connector. With an external programming adapter (DinXProg) the SER2 of the processor is made accessible. 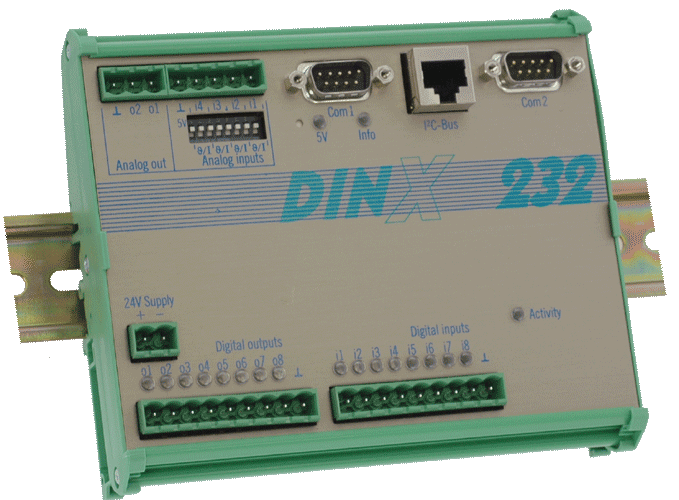 DinXProg converts the processor signal into RS232 (9pin Sub-D) and connects the I²2C-interface to the i/o extensions. In addition to cost effectiveness, this solution provides protection against misuse and an reserved service interface. The 24V inputs are implemented with optocouplers and input filters as on most ELZET-modules. Each input has a red control LED. I1 is connected to Ti8 an can be used as input or trigger to the 16bit-counter, with appropriate low level programming. I2 and I3 are µDMA linked, their address counter being used as 32bit-universal-counter in this case. The DMA-ports are not used for any other purpose. To save on connectors compared to for example TSM, only the signal inputs are separate for each port, ground connections have to be distributed externally. The 24 V outputs are realized by short circuit and temperature protected quad-high-side-drivers, which provide up to 700mA. Since the outputs are not optoisolated they are supplied by the 24V supply voltage of the module. Yellow LEDs show the output condition. If the 8 in- and outputs should not be enough, there is the possibility of modular extension over the I²2C-bus. 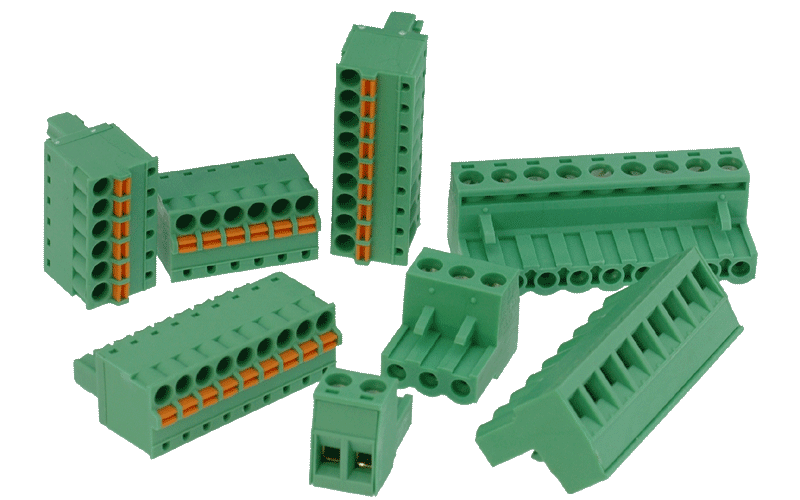 Modules can be connected with RJ45 patch-cables, the same as used for Ethernet. There can be up to four extension modules, for example with 16 24V inputs or 8 inputs and 8 outputs each. But also other customer specific extensions can be used with the I²2C-bus. The sensing of the inputs and the refresh of the outputs is done by the operating system in the background and every 10 ms; the i/o are addressable in mCAT as objects just as the internal i/o. Merely a watchdog function is not possible over the I²2C-bus, outputs usually stay in their last condition if the software "freezes". But in contrast to the internal outputs, I²2C-extensions allow to turn off the supply voltage by an emergency stop switch for example. On DinX processor and i/o have a common feed, but i/o modules have their own. mCat allows realtime functions on DinX, for example setting and reading system time as Unix time or alternatively as calendar structure with year, month, day, hour, etc. Moreover nonrecurring messages can be ordered for a desired point of time and at a selectable priority or messages can be subscribed to at a fixed interval. The "A" version of DinX includes a battery backed-up realtime clock with calendar, which sets the system time on power-up and adjusts it regularly.